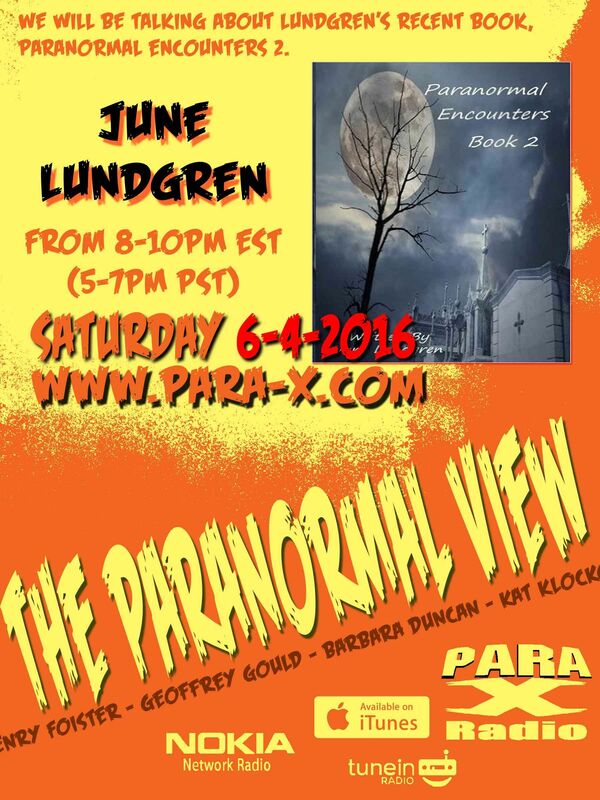 Our guest tonight was June Lundgren, author of The DarkSide of the Paranormal, Paranormal Encounters, A Medium's Guide to the Paranormal, and Paranormal Encounters Book 2 (while my inquiry was tongue-in-cheek, she is indeed related by marriage to Dolph Lundgren, via her husband). Ceiling Cat Barbara Duncan started out, asking June about vortices, considering June can See vortices, through which spirits pass back and forth. June spoke of a vortex and portal being opened in the Portland, Oregon Shanghai Tunnels that June had to close. She spoke of being raised mostly by her grandmother, who could also See Spirit, and June learned how to communicate with animals. Kat asked for Sherri in the chat room regarding reading her daughter "who is a shark." Aussie listener Jeff Dean asked about the recent murder of Harambe the gorilla; June and I concurred the primate meant the child no harm. After the second break, CC reported our having listeners tonight in the USA, the UK, Canada, Singapore, Germany, the Netherlands, and Unknown. We discussed ghosts, demons, angels, hat men, shadow people, graveyards and such. As often is the case, we had to remind Henry is has finally seen a ghost, "albeit" only the red burning cigarette ash of ghost soldiers smoking during his and kat's investigation. June gave her out book information, as well as her latest book, a paranormal romance titled Outta Time. Kat conveyed her attending the upcoming July 16/17 Ocean State ParaCon, tickets for which one can acquire at the convention website. Henry announced that next week we would have Suzanne Ramsey co-author of the book The Aztec UFO Incident.